The Lesser Prairie-Chicken: Gone With the Wind? After decades of stresses, the lesser prairie-chicken faces a brand-new threat: Oklahoma’s wind farms. North on U.S. 270 to Woodward, Oklahoma, wind turbines own the horizon. They hover above rusting barns, cattle-guards and the barbed-wire fences that protect private land. When standing below, you feel the massive blades swoosh like flyswatters cutting through the air. As the wind picks up, the blades spin faster and the machines emit a soft mechanical whine: the sound of power generated by nature. The town, home to 12,000 people, lies in the northwest corner of the state. The citizens who are paid to house the silo-sized white turbines on their property may not see controversy in them. But other locals see them as eyesores — or something even worse. The energy scarecrows rise south of Woodward and west into the panhandle, spreading widely across the landscape. This dry, warm environment once gave rise to some of the most dynamic ecoregions of what is now the United States. Short, sod-forming grasses that evolved with the climate set the western short grasslands apart from other kinds of prairies. The prairie’s proximity to the tropics funneled in an incredible diversity of insects, birds and mammals. Seeing the number of endemic species would have been as breathtaking as watching turbines fan across U.S. 270. But now, the region’s bird populations are among the fastest declining on the continent, and the turbine is the latest aggressor to swat native species out of existence. The flat, windswept plains seem to be made for renewable energy. Can the wind industry harbor as much hope for conservation as it does for renewable energy? One bird — the lesser prairie-chicken (Tympanuchus pallidicinctus) — will test that possibility. The lesser prairie-chicken belongs to the grouse family of birds so iconic to prairie culture. This brown-barred, stocky species nests in shrubbery and grasses of the Texas panhandle, Oklahoma, New Mexico, Kansas and Colorado. It’s about the size of a 20-ounce bottle of Coca-Cola. In a flashy mating ritual called lekking, the male chickens’ necks flair with inflating red air sacs to wow female chickens during spring nesting. But this elaborate mating ritual is now harder to perform as shortgrass habitat loses ground to development, agriculture and other industries. David Hunter, owner of Hunter’s Livestock Supply in Woodward, recollected that the prairie-chickens were often spotted on his family’s 120-year-old farm in eastern Woodward when he was young. “There were just thousands of them everywhere,” the 57-year-old told me. In northwestern Oklahoma alone, the bird’s habitat once covered 12 counties. Today their range has shrunk to isolated pockets in seven counties, all near or in the panhandle. U.S. Fish and Wildlife Service estimates that the prairie-chicken has lost as much as 84 percent of its historic prairie and grassland. 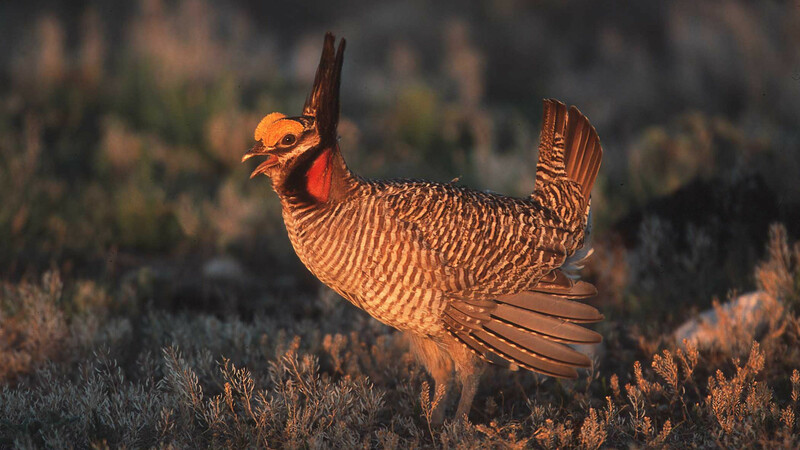 The Service first named the lesser prairie-chicken as a candidate for the Federal List of Endangered and Threatened Wildlife in 1998 and declared the bird “threatened” in 2014. When a species gains a place on the list, it is protected by law from hunting or trade, its habitat gains legal protection from being destroyed or adversely modified, and the agency develops and implements a conservation plan. The lesser-prairie chicken and state conservation departments were set to benefit from the federal aid. But just over a year later, the Permian Basin Petroleum Association and several New Mexico counties challenged the listing in District Court. Permian Basin won the suit in September 2015, effectively ending federal Endangered Species Act protection for the bird. The move became official in July 2016. Almost immediately, wildlife conservation groups began petitioning for the prairie-chicken to be listed once again. “We are undertaking a new status review to determine whether listing is again warranted,” wrote then-Service director Dan Ashe in a statement, “and we will continue to work with our state partners and others on efforts to…ensure this flagship of the prairies survives well into the future.” A few months later the Service agreed to reconsider protecting the species by the end of Summer 2017 — a decision that is already overdue. Alva Gregory is the lesser prairie-chicken habitat coordinator for the Oklahoma Department of Wildlife Conservation and grew up in the county with the highest prairie-chicken populations. He told me from his office in Woodward that many dynamics factor into the species’ decline. “Whether it’s wind [turbines], whether it’s transmission lines, oil and gas,” he said, “It’s just a huge gamut of stuff that affects it.” A four-year drought and industry expansion have recently contributed to the lower bird numbers. Yet it’s the chicken’s innate fear of looming, vertical structures that has made turbines so disastrous in Oklahoma. Russ Horton, a research supervisor with the department of conservation, told me that prairie-chickens instinctively distance themselves from anything they might perceive as a raptor perch, high lookouts where wolfish birds scout for meals. Even tree-planting has hurt prairie-chicken populations, since the skittish birds avoid anything that casts a shadow. They’re a bird of the grasslands after all, Horton said, and there’s not a whole lot that naturally sticks up from the state’s mostly flat landscape. Raptors such as red-tailed hawks and prairie falcons prey on ground-nesting birds of all kinds. And the lesser prairie-chicken is particularly vulnerable, especially during spring nesting season. As a female lays and then incubates her clutch of about a dozen eggs, Horton said, “she’s tied to a spot about the size of a dinner plate for over a month.” The hens incubate their eggs while coming and going to feed themselves for just over three weeks, making themselves easy targets for birds of prey. Turbines give the lesser prairie-chicken an uncomfortable feeling of being watched. 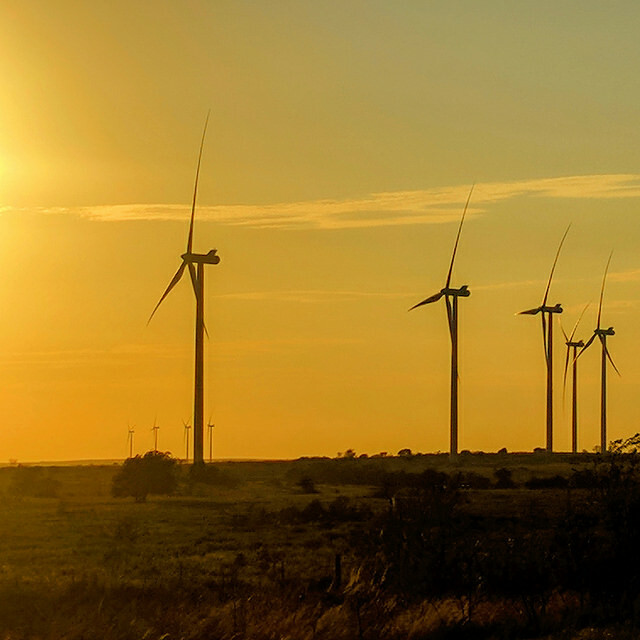 Northwest Oklahoma, where lesser prairie-chickens occur, now houses more wind farms than any other part of the state. Just over a decade ago, the state’s utilities had no turbines to produce wind energy. Now, its capacity is ranked fourth in the nation. With a new transmission project set to transport wind power to Arkansas and Tennessee, more farms being constructed, and still more room for growth, the market shows no signs of slowing down. The state’s largest utility company, Oklahoma Gas and Electric Co., owns and operates three such wind farms in northwest Oklahoma, plus two more south of Woodward. Built between 2003 and 2007, the turbines came online before the lesser prairie-chicken was placed on the endangered species list in 2014. Still, to monitor any impacts the turbines may cause to the prairie-chicken and other wildlife, the utility formed a partnership with the state and federal wildlife agencies. Usha Turner, the utility’s corporate environmental director, says her company has “had conversations with local and federal agencies about the lesser prairie-chicken,” even though it was only listed for a few years. Once the bird was protected under the Endangered Species Act, the utility became a voluntary member of the Western Association of Fish and Wildlife Agencies, a group dedicated to preserving and maintaining wildlife in the West. The association operates in each of the five states that prairie-chickens call home and has collected over $42 million in enrollment and impact fees from companies causing “unavoidable impacts” to habitats and ecosystems. All fees go toward off-site mitigation projects, such as contracts with private landowners to leave their property as feral grassland. As of 2015, ten 10-year contracts for more than 96,000 acres had been finalized. Yet the utility’s relationship with the lesser prairie-chicken and its habitat remains complicated. To date, the utility has avoided paying mitigation fees to offset any impacts from its turbines since turbine installation in the bird’s habitat was completed prior to the chicken’s 2014 listing, Turner said. While the company’s wind developments have dominated the area since Oklahoma’s green-energy endeavors began in the early 2000s, the utility has secured roughly 40,000 acres of habitat for prairie-chickens and other grassland animals. Prior to that, Turner said, an agreement with the state wildlife department saw the company direct over $8 million dollars toward prairie-chicken habitat preservation. Still, the utility isn’t blind to declining prairie-chicken numbers. Even before its listing, Turner told me, they worked with wildlife agencies to relocate turbines and transmission infrastructure away from regions containing known prairie-chicken habitat. An important move, to be sure, but one that won’t halt or likely even slow the bird’s dramatic population loss, especially with more than three dozen new wind farms in the pipe for Oklahoma alone. Six of these farms will be built near or in the panhandle; four are coming to Woodward and Ellis counties, while the same number will be built in Texas, Beaver and Woods counties. As they rise, prairie-chickens fall. While the list of factors impacting the bird’s habitat is ever-increasing, Horton believes it largely comes down to habitat loss and degradation. “There used to be, at one point in time, just literally endless miles, miles, miles and miles of continuous, good habitat,” Horton told me. Many miles of that habitat are now gone, and the causes are legion: urban sprawl, road construction, energy infrastructure expansions, field conversion to non-native crops and, yes, wind turbines. All of it has hurt prairie-chicken habitat. Despite challenges in stemming the loss of prairie-chickens, Horton knows that no one wants to see the charismatic bird suffer extinction. “If there was a clear solution, you and I wouldn’t be talking about prairie-chickens,” he told me. “It would have been implemented already. It’s not easy.” He feels there are potential solutions in conservation efforts that focus on finding common ground between competing interests on the landscape. The state and federal wildlife agencies encourage private landowners to manage their land for high quality native habitat, which provides desirable food source, among other benefits. The G. M. Sutton Avian Research Center has implemented an initiative to mark barbed-wire fences with white vinyl clips about three inches long. The clips are said to allow chickens to see the fence clearer so they don’t get stuck (locals mock this theory). Whether it’s land management or simply good weather conditions, prairie-chicken numbers have bounced back in the past few years. The Western Association of Fish and Wildlife Agencies reported that between 2014 and 2015, aerial surveys showed a 25 percent population increase in three-quarters of the ecozones where lesser prairie-chickens are found, stretching from New Mexico to Kansas and into Colorado. In 2015 USFWS figured that lesser prairie-chicken numbers hovered around 30,000, a significant rebound after the population dipped to a low of 17,000 in 2013. Originally published by New Territory magazine. © 2017 Bryce McElhaney. All rights reserved. 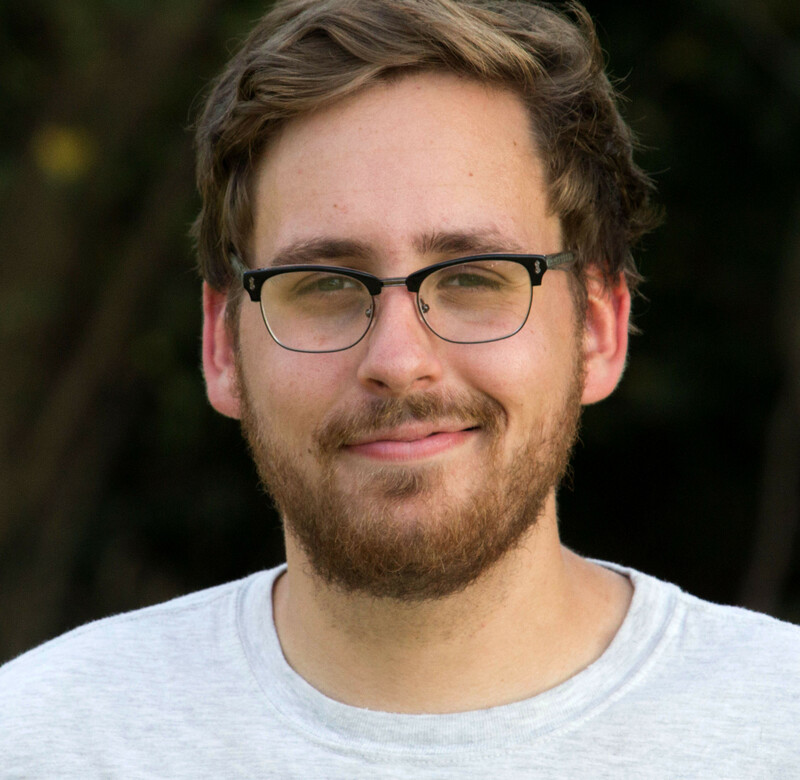 is a writer and online editor for the New Territory magazine, hailing from Norman, Oklahoma.